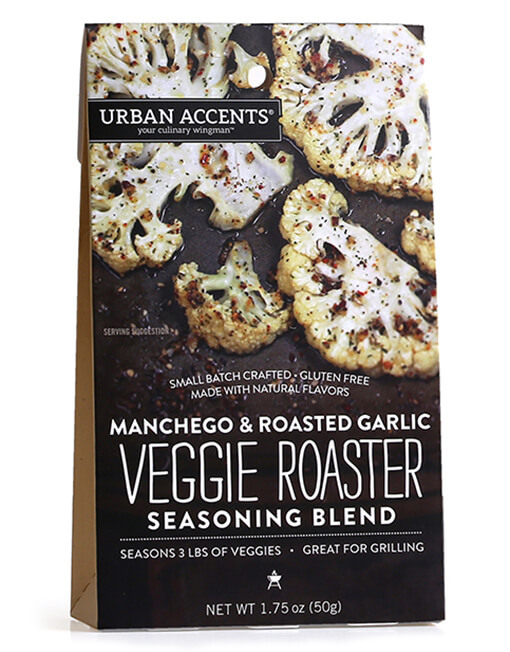 Roasting veggies with the great flavor of manchego cheese & warm roasted garlic is easy with our blend of onion, garlic, natural manchego cheese flavor and other spices. Just mix rub with olive oil and melted butter, then brush on cauliflower “steaks” or sliced potatoes. Each package seasons three batches of veggies. Gluten Free. Ingredients: Dehydrated Onion and Garlic, Natural Cheese Flavor (Manchego Cheese [Pasteurized Milk, Cheese Culture, Enzymes], Whey, Corn Syrup Solids, Salt), Sea Salt, Spices (Black Pepper, Parsley), Nonfat Dry Milk, Dehydrate Bell Peppers, Evaporated Cane Juice, Natural Flavors, Yeast Extract, Lactic Acid, and less than 2% Soybean Oil and Silicon Dioxide added as processing aids. Contains: Milk. Nutritional Info: Serving size: 1/4 tsp (1.1g), Servings per container: 45, Amount per serving: Calories 0, Total Fat 0g (0%dv), Sodium 75mg (3%dv), Total Carbohydrates <1g (0%dv), Protein 0g, Vitamin C 4%. Not a significant source of Fat Calories, Saturated Fat, Trans Fat, Cholesterol, Fiber, Sugar, Vitamin A, Iron, and Calcium. Percent Daily Values (dv) are based on a 2,000 calorie diet. The sweet taste of an autumn snack… any time of the year! Gluten Free. Our everything, everyday seasoning is an all natural, small-batch blend of salt, black pepper, parsley, garlic, and over eight other herbs and spices. It’s a great flavor boost for every dish you prepare from a simple appetizer to your favorite roast, poultry, fish or veggie recipe. Gluten Free. Inspired by the cooking in the rural Provence area of France, this mixture is best used with poultry and seafood and can also add to a flavorful salad dressing. Our blend of rosemary, savory, fennel, thyme, lavender and more should be the cornerstone of any well-stocked spice rack. Kansas City Classic Rub is a coarse blend of brown sugar, ancho, chipotle, allspice and more with its roots in the Heartland of America. It’s delicious on ribs, pork chops, pork tenderloin and even steaks with its own signature flavor of sweet and spicy heat. Gluten Free. A sophisticated blend of Italian cheese flavor and smoky pepper makes your freshly-made popcorn utterly delicious… just shake it on and start munching! Gluten Free. Our Cayman Citrus Dryglaze is a complex seasoning blend of chili, citrus & a kick of jalapeño to give your dishes a spicy Island flavor. Delicious on seafood, chicken and pork. Address: 103 S Main St, Shawano, WI 54166.